“Chook” Norris, named after the great American martial arts actor “Chuck” Norris, is a 2-year old male white Pekin Bantam. However, unlike the actor, Chook Norris hasn’t earned his blackbelt quite yet. He is the proud leader of a small backyard flock however, consisting of four hens. The Pekin breed of chicken are not only known for their small size, but also their feathered feet. Pekin roosters have slightly longer feathers protruding outwards from their feet. Although the feathered feet and legs is an attractive feature, there are some drawbacks. 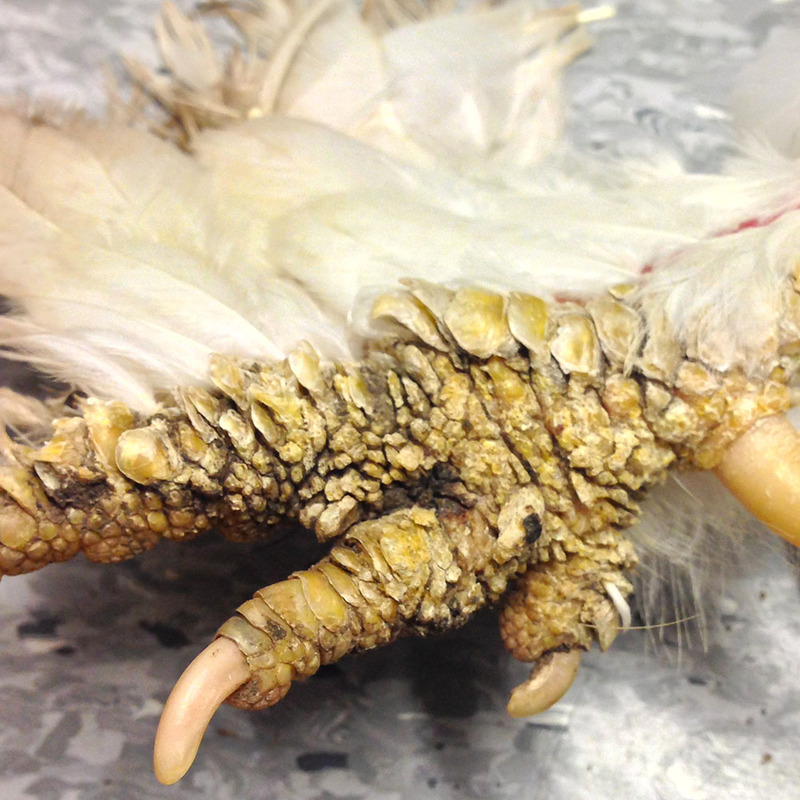 Feathered feet and legs have a tendency to collect mud and debris, and excess moisture. Any prolonged exposure to moisture can cause a temporary breakdown in the skin barrier that protects itself from invasion by secondary organisms. 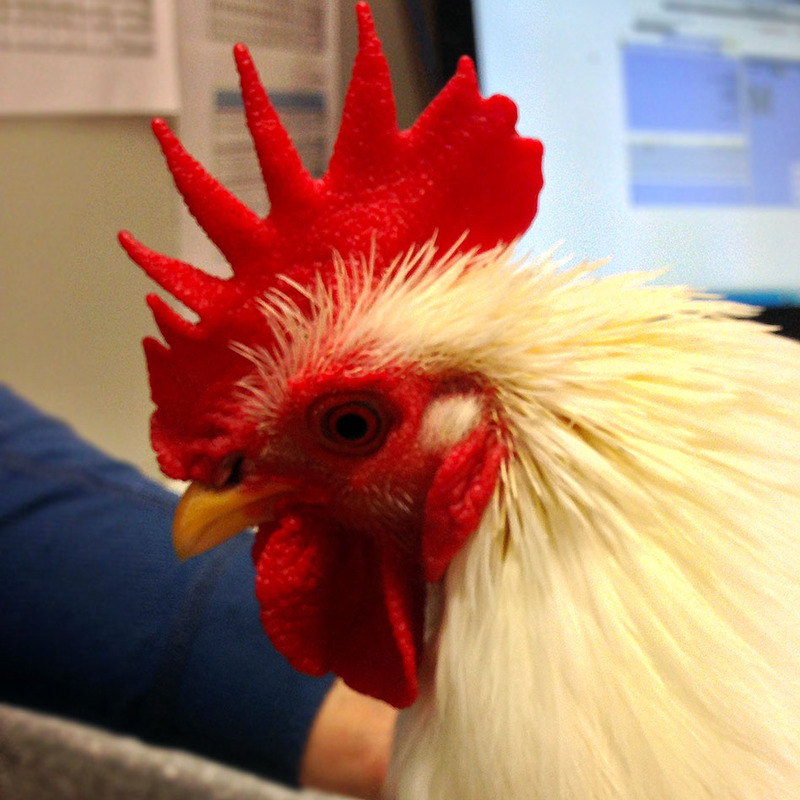 Chook Norris waiting patiently to be examined by the Doctor. 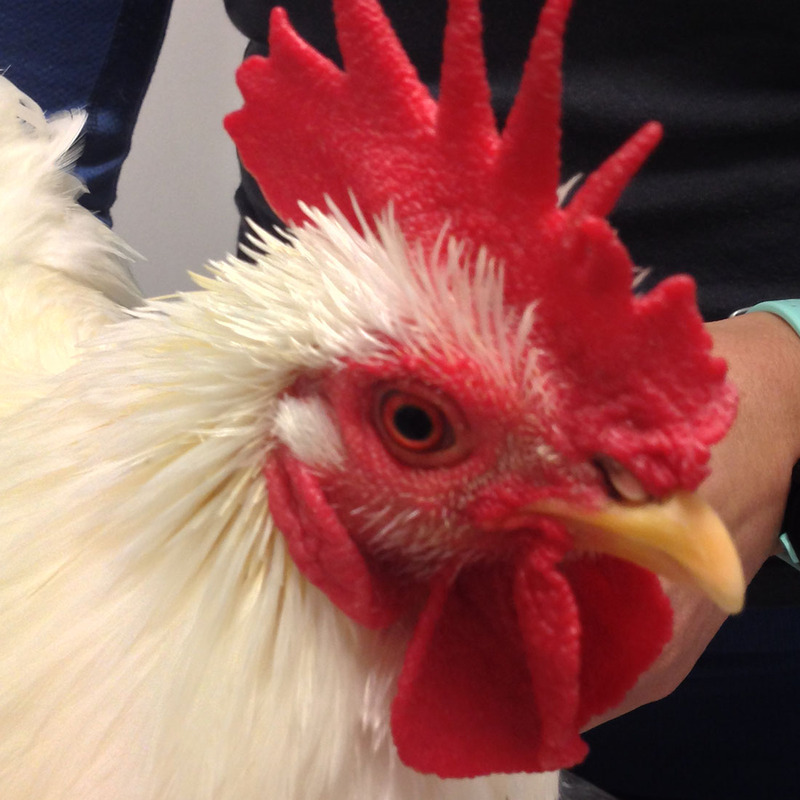 Chook Norris’s owner brought him into Bird Vet Melbourne for his annual veterinary checkup. During the examination, his owner indicated that she was concerned about his spurs----as they had grown rather long and were curving back into his legs. Upon inspection of Chook Norri’s legs, Bird Vet Melbourne agreed that his spurs needed to be trimmed. However, there was no evidence of any existing soft tissue damage to Chook Norris’s legs---as thankfully, his owner caught the problem early. 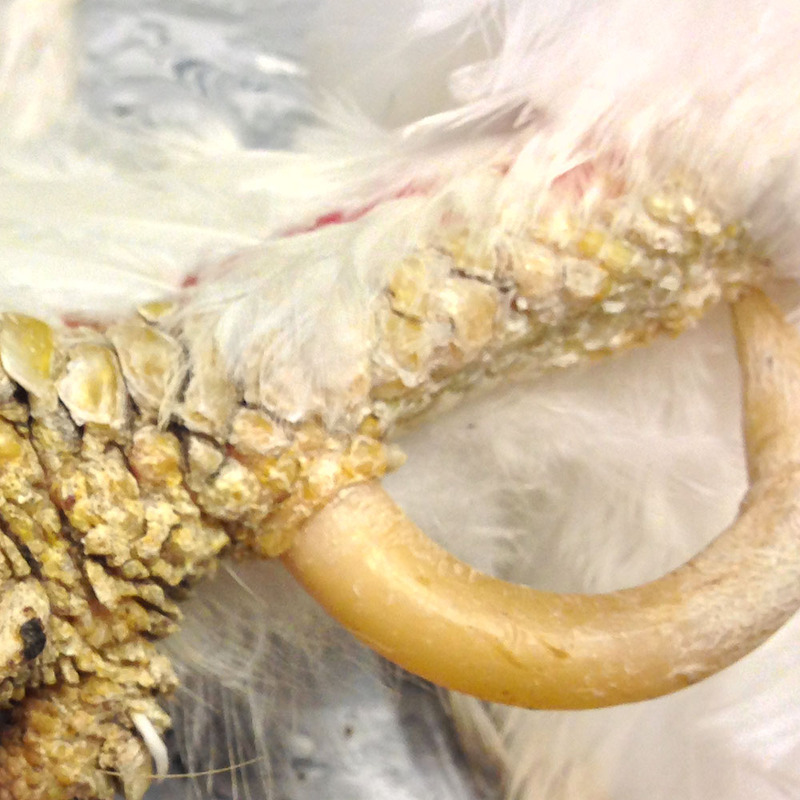 In addition to the abnormal spur growth, upon examination Bird Vet Melbourne also noticed that the rooster’s scales on his feet appeared abnormal. Chickens with “normal” healthy feet have smooth scales that lie flat against the surface of their feet and legs. 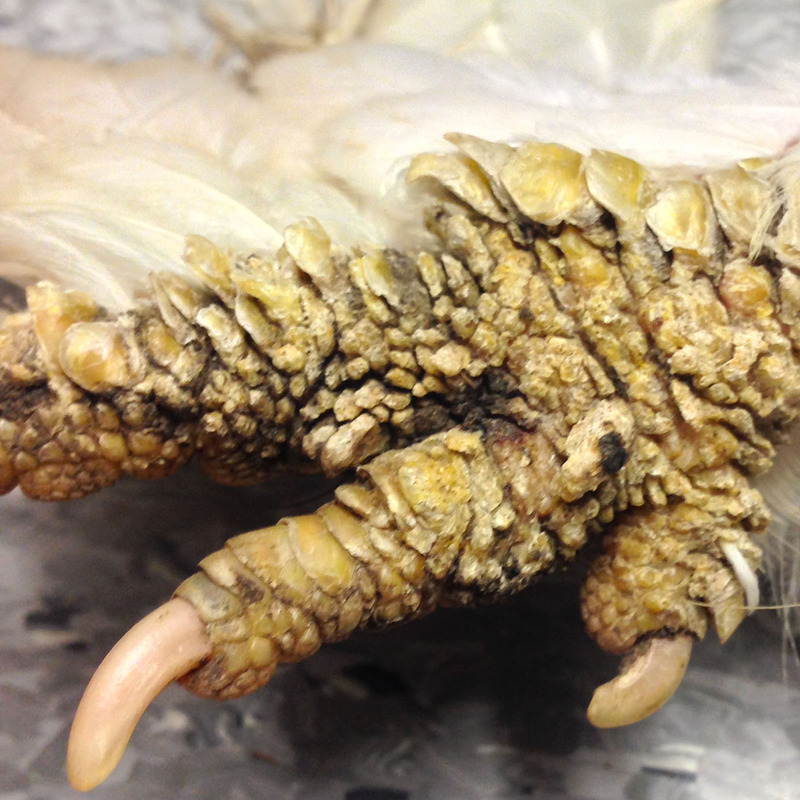 The scales of both of Chook Norris’s feet were roughened, crusted, uneven, and a large percentage were lifting upwards---signs indicative of scaly leg mites. 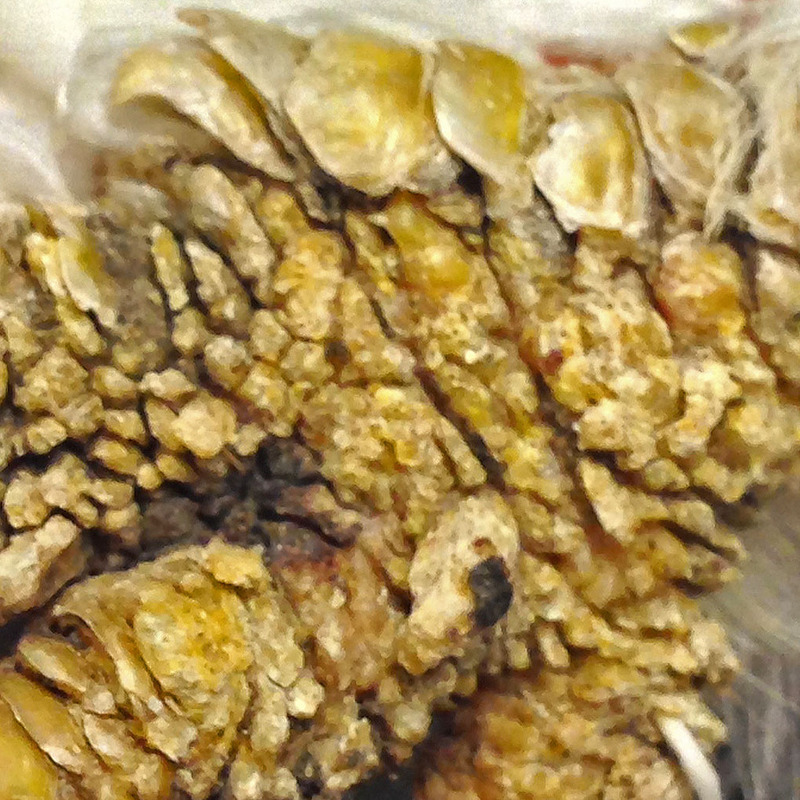 The scaly leg mite (Knemidocoptes mutans) is an external parasite of chickens which causes damage to their legs and feet by burrowing into and feeding on the keratin contained within the scales. Because these mites are so tiny, they are not visible to the naked eye. 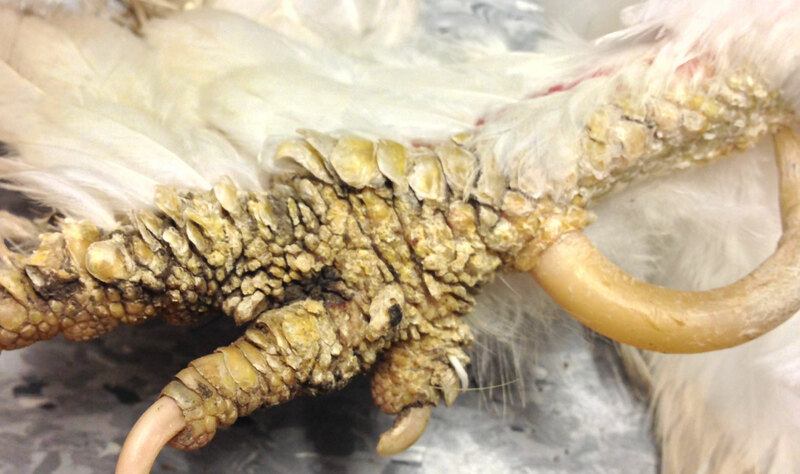 Appearance of Chook Norris's feet before treatment. 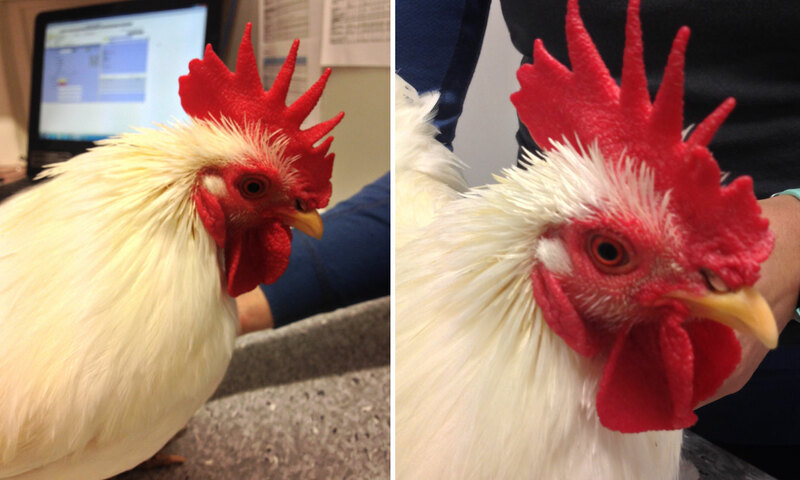 After completion of the physical examination, Bird Vet Melbourne gave Chook Norris a proper spur trim. For treatment of the scaly leg mites, Bird Vet Melbourne applied a topical paraffin oil to the rooster’s feet and legs. The topical liquid paraffin acts to 'suffocate' any living mites within their honeycomb nests on the legs, by preventing access to oxygen. Chook Norris also received a single oral dose of moxidectin---a specific type of anthelmintic drug—which kills any remaining living mites and prevents further reproduction/development of juvenile mites. Bird Vet Melbourne advised his owner to continue with the oil application once daily, and to repeat the dose of moxidectin once every two weeks, as needed, until the scale abnormalities completely resolve. Since scaly leg mites usually jump around from bird to bird within a flock, Bird Vet Melbourne indicated that it was a high probability that other members of Chook Norris’s flock were affected as well. If they were infected, they too would require the same treatment as Chook Norris in order to prevent re-infection, and to successful control the mite infestation in the surrounding environment. Bird Vet Melbourne advised Chook Norris’s owner that if the scaly leg mite issue did not resolve within the next four weeks, that they schedule another appointment for them to see him again, in order for them to investigate possible underlying causes of the immunosuppression that was causing the mites to remain.